I tell you I was the Maestro! Alan Greenspan has just released a 48-page essay titled ‘The Crisis’ via the Brookings Institute, which the Economist bills as the latest defence of his performance as federal reserve chairman.In a similar vein to Ben Bernanke, Mr. Greenspan argues that while he controlled short-term interest rates, long-term interest rates were largely out of his control, and were actually kept low by a ‘global savings glut’ from developing nations like China. Both men make three broad points. First, they deny that monetary policy in the early 2000s was excessively loose by traditional central-bank rules of thumb. That is a criticism frequently made by John Taylor of Stanford University, author of the Taylor rule on how interest rates should change in response to movements in inflation and GDP. Mr Bernanke points out that based on contemporary forecasts for its preferred inflation measure, the Fed actually followed the Taylor rule reasonably closely. Second, both men say there is no evidence that low short-term rates drove house prices upward. Mr Greenspan argues that the statistical relationship between house prices and long-term rates is much stronger than with the Fed’s policy rates, and that during the early 2000s the traditionally high correlation between policy rates and long-term rates fell apart. Mr Bernanke points to structural models which show that only a modest part of the house-price boom can be pinned on monetary policy. Third, Messrs Bernanke and Greenspan point to the global nature of the house-price boom as proof that monetary policy was not to blame. Both cite new research from economists at the Fed showing that the looseness of monetary policy in different countries was not correlated with changes in house prices. 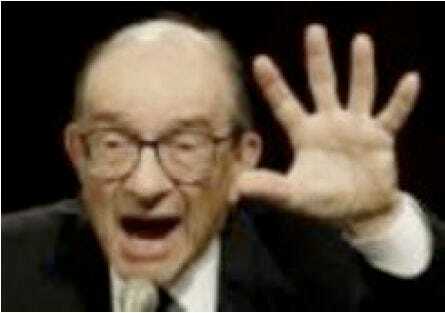 We’ve attached Mr. Greenspan’s full essay below, from Brookings.